Ok, so it’s been a while. But I have just kicked off with a new blog here. Let me know what you think! Well the dust has settled and I can now reflect a little on what went well last half term and what I still need to work on. Using green pens for peer marking has worked. Not lost a single pen yet! The Three act lessons are going down well with Year 8 although I have not really tried them with other groups yet. Adding variety to computer room lessons is working although it makes these harder to plan. I need to stop talking so much! I failed miserably on this front but I need to look at this again. I was lucky enough to go on a course just before the Easter break started. 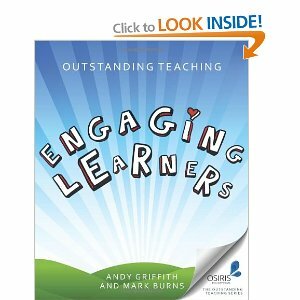 It was by Osiris Education and was about how to make your teaching outstanding. I have to say it was a mixed bag. The ideas were good but it was just far too broad (there were teachers across all the Key Stages). Some ideas were genuinely really good but they just came to thick and fast! I did buy the book (actually before the course) and this made a lot more sense and was in a much more logical order. I would recommend it to anyone who wants to improve their teaching and put a fresh spin on things. The book is here on amazon. I also stumbled across this week (that’s a lot of stumbling) this site which gives free posters on a whole variety of topics which can then be printed out and laminated for displaying around classrooms. I stumbled upon this site which has quite a number of interesting activities. The site is from New Zealand and seems mainly targeted at Year 6/7 (and below) but is worth a look. I can’t remember where I saw this but I saw it as a bar trick first. My year 8 class have been studying circles and so I showed them this starter. I got a pint glass and asked the question “Which is bigger the circumference at the top of the glass or the height of the glass?”. It is an optical illusion and most of the class voted for the height. I then put the glass on a thick book and asked again. Virtually all now agreed it had to be the height (with book). However, a bit of string showed it was still the circumference. Try it and see, you might be surprised. Filling the glass with your favourite beverage whilst testing the idea is, of course, optional. One of my colleagues discovered this site. It seems good as it allows you to generate worksheets on lots of topics. These are then produced into a pdf (with answers) making the idea of producing several similar worksheets but with different figures really quite simple. This means students can’t just “borrow” other student’s answers. All the answers are created so they can just be printed out along with the worksheets. The only downside is that this is a subscription service. It’s not outrageously expensive and does give you lots of options. I produced my first worksheets this weekend so these will get tried this week.